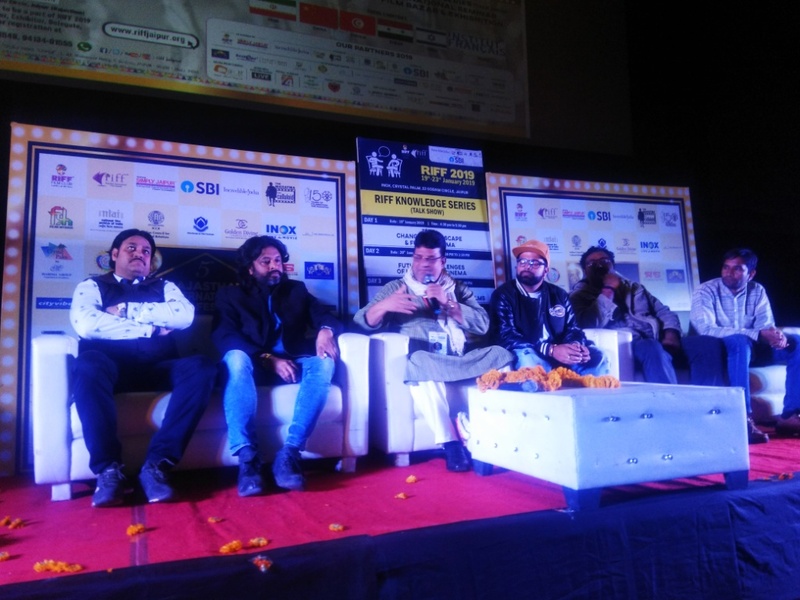 On the second day of the fifth edition of Rajasthan International Film Festival (RIFF), which is going on at Inox Crystal Palm situated at Shakar Marg. Today being a holiday the venue was filled with a large number of movie enthusiasts as well as movie lovers who watched the movies and appreciated them. Special screening of National and International films including Rajasthani. The video of ‘Rajasthani song Bai Sara Beera’ was also shown on the big screen, which was enjoyed by all. This song was written by Suparna Ghosh, along with playback singer Ravindra Upadhyay, in her melodious voice. On the second day, there was a lot of interesting dialogue between Future and Challenges of Rajasthani Cinema Talk Show. It was revealed in the discussion that Rajasthani film is to be given high quality, then instead of government subsidy, Rajasthan Film Development Corporation should be formed so that the corporation provides finance to the Rajasthani films. In NSD alone, a budget of 26 crores for 26 students and 6 students in FTII has been fixed for 75 crores. Such institution should also be in for Rajasthani. Apart from this, the entertainment tax that the government takes. He should make such a cinema where one hundred of the Rajasthani films can be displayed in a day. Playback Singer Rabindra Upadhyaya, Rapperia Balam of Rajasthani movies, MA Qureshi of Rajasthani films and Om Sau put the views in it. Moderate senior critic Ajit Roy of the show did the show. Singer Ravindra Upadhyay said that making a movie here can be easy, but taking it to the theater is no less than a challenge. He said that Rajasthani language also changes colors like water here. In Rajasthan, for instance, the tone of the bid is different in terms of directions. He said that it is a matter of regret that Bollywood is populated by the beautiful places of Rajasthan and culture and folk music and dance. Rajasthan cinema is helpless in every way. Rabindran said that it was more than 15 years for me to take Rajasthan to Rajasthan, but now it is Dil-Khwaish that will do a lot to upgrade the Rajasthani cinema so that our government can take care of us. Actor MA Quraishi said that it is not that the Rajasthani cinema does not get spectators. If you talk about the eighties, then a lot of people saw the movie by Chali Sasrio. Om Saau, who is associated with the Rajasthani film, said that the Rajasthan film industry will not be able to speed up when every Akshah associated with the film does not communicate in its Rajasthani language. On Sunday, screening of Anil Saini directed film ‘Mauser’ was done at RIFF. The social evils were depicted in the movie based on the festival of death. How do people get ruined by such a mouser like Kurti Around this, the film's warp is woven. In this film written by Anil Bhupe, the actors like Murarilal, Usha Jain, Zodhi Sharma, Vinay Chaudhary, have made the story very touchable with their strong acting. The RIF has screening of the second Rajasthan film Merao Ram Rahim. Producer, director and actor Manjur Ali Qureshi's film depicts social, communal harmony in this film. The film's writer Santosh Nirmal and the artist were present during the screening. On Sunday evening, screening of Deepak Tripathi regional film Tuhenje Pyaar was done. A lot of the audience enjoyed this movie. On Monday, there will be screening of many country-of-the-country films including the talk show, local including the show on Monday. In it, all directed by Gurprasad Singh will be the special screening of the film, directed by Ajitpal Singh, directed by Ramesh Gammat and Shyam Benegal, directed film The Making of the Mahatma. Besides this there will be a television movie thematic talk show.